Part 1 was about the excessive fear some people have about chemicals / toxins that they think are out to get them. There seems to be the increasing rejection of science that everyone benefits from, like the great technological improvements it’s brought to our lives (e.g. chemophobia powered by social media). Some believe that 20 minutes of googling is equal to 30 years of education and scientific research. Just today, I got an email from a customer and was dismayed at one of his comments……..what else…..chemikillz! He mentioned where he used to buy soap in his home town because it -“didn’t have lots of chemicals listed as their ingredients“. It’s time to talk about what no one else is…..the role of makers propagating crap to get a leg up on their competition with their “it’s bad for ‘ya” claims. Here’s an example with no citations. Seems fact checking has gone out of style. I’m betting the person is selling something with essential oils, and knocking fragrance oils. She’s gonna milk this paranoia. How did we go from Avon and Tupperware to peddling crap like this? For people in the cosmetic business- it would be great if they instead defended our industry as safe. Because it is. The public is nervous enough thanks to NGO’s et al. Nothing in life is without risk. To put it in perspective, traffic accidents kill 1.24 million people a year worldwide; wars and murders, 0.44 million. Do we still drive cars? Pick your battles. Calm the F down! None of us are getting out of here alive, so if you like a traditional perfume-enjoy it. Referring to the part 1 discussion, we makers do have to consider what our customers will think. A maker can pander to these folks by changing suppliers and labels to words a 7 year old can pronounce (performance be dammed). Another option is to avoid being a cosmetic apologist, by explaining the origin or function of an ingredient in parentheses e.g., decyl glucoside (from coconut oil) to put the customer at ease, since it’s a “chemically” sounding name. 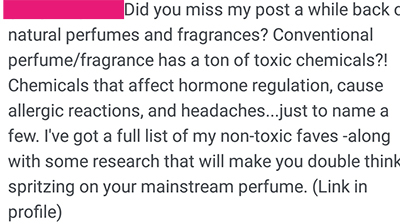 Educating the consumer using science, by referencing the Cosmetic Ingredient Review is is a good way to show the safety of ingredients to customers. Give weight to ideas that are evidence-based. With chemophobia and misinformation so rampant, I don’t see a lot of makers defending the industry. Some are enablers playing into consumer fears and positioning their products as non-toxic. (I just sprained my eyes by rolling them). Skin care should make you soft, and it shouldn’t be a philosophical obsession about ingredients. Some people need to get a grip.